This article is about the geological feature. For the lake of the same name in Oregon, see Crater Lake. For other uses, see Crater Lake (disambiguation). Not to be confused with lava lakes, a rare phenomenon where a volcanic crater can sustainably contain a significant volume of molten lava. 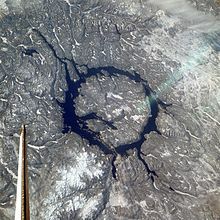 A crater lake is a lake that forms in a volcanic crater or caldera, such as a maar; less commonly and with lower association to the term a lake may form in an impact crater caused by a meteorite, or in the crater left by an artificial explosion caused by humans. Sometimes lakes which form inside calderas are called caldera lakes, but often this distinction is not made. Crater lakes covering active (fumarolic) volcanic vents are sometimes known as volcanic lakes, and the water within them is often acidic, saturated with volcanic gases, and cloudy with a strong greenish color. For example, the crater lake of Kawah Ijen in Indonesia has a pH of under 0.5. Lakes located in dormant or extinct volcanoes tend to have fresh water, and the water clarity in such lakes can be exceptional due to the lack of inflowing streams and sediment. Crater lakes form as the created depression, within the crater rim, is filled by water. The water may come from precipitation, groundwater circulation (often hydrothermal fluids in the case of volcanic craters) or melted ice. Its level rises until an equilibrium is reached between the rates of incoming and outgoing water. Sources of water loss singly or together may include evaporation, subsurface seepage, and, in places, surface leakage or overflow when the lake level reaches the lowest point on its rim. At such a saddle location, the upper portion of the lake is contained only by its adjacent natural volcanic dam; continued leakage through or surface outflow across the dam can erode its included material, thus lowering lake level until a new equilibrium of water flow, erosion, and rock resistance is established. If the volcanic dam portion erodes rapidly or fails catastrophically, the occurrence produces a breakout or outburst flood. With changes in environmental conditions over time, the occurrence of such floods is common to all natural dam types. Due to their unstable environments, some crater lakes exist only intermittently. Caldera lakes in contrast can be quite large and long-lasting. For instance, Lake Toba (Indonesia) formed after its eruption around 75,000 years ago. At a size of around 100 km (60 miles) by 30 km (18 miles) in extent and 505 m (1,656 ft) deep at its deepest point, Lake Toba is the largest crater lake in the world. While many crater lakes are picturesque, they can also be deadly. Gas discharges from Lake Nyos (Cameroon) suffocated 1,800 people in 1986, and crater lakes such as Mount Ruapehu's (New Zealand) often contribute to destructive lahars. Lakes can also fill impact craters, but these are not usually referred to as crater lakes. Examples include Manicouagan in Canada, Lake Bosumtwi in Ghana and Siljan in Sweden. More rarely they can also fill craters caused by artificial explosions, such as the radioactive Lake Chagan in Kazakhstan. Some circular open-pit mines can also present a similar appearance, such as Big Hole in Kimberley, South Africa, a diamond mine (in a kimberlite pipe) where water has accumulated in the artificially created depression. 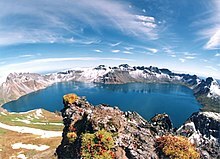 ^ "Facts and Figures about Crater Lake". U.S. National Park Service. Retrieved 2009-03-17. ^ Glenday, Craig (2010). Guinness World Record 2011. ISBN 9781904994572. 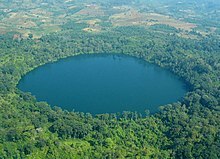 Wikimedia Commons has media related to Crater lakes. Delmelle, Pierre; Bernard, Alain (2000). "Volcanic Lakes". In Sigurdsson, Haraldur (ed.). Encyclopedia of Volcanoes. San Diego: Academic Press (published 1999). pp. 877–895. ISBN 978-0-12-643140-7. Pasternack, G. B.; Varekamp, J. C. (1997). "Volcanic lake systematics I. Physical constraints". Bulletin of Volcanology. 58 (7): 526–538. Bibcode:1997BVol...58..528P. doi:10.1007/s004450050160.